As you are getting ready to take GRE test, these 4 simple Revised GRE test taking tips should come in handy. Your primary goal during practice sessions is to learn strategies and techniques that to solve a problem in less time. When you are under pressure and time crunch, GRE test taking tips and techniques you learned should be like muscle memory that comes to your rescue. When I started going to the gym to do weight and strength training, I started with 15 lbs dumbbell. After 45 days, I started the session with 40 lbs dumbbell. It takes the time to build strength. Same applies with GRE Test prep. It takes the time to build your skills specific to solving GRE test problems. You can also refer to detailed GRE Test Prep tips used by a reader to score high percentile. Take one GRE question at a time. Too much tension can ruin your GRE test score. Keep calm, attack each GRE problem with a fresh mindset. Don’t let previous question, section’s performance to impact you to solve the next question. Answering GRE question is like playing the game of golf. One bad shot can ruin the entire game. Unless you know how to keep your composure in check. If you don’t have a mindset to recover between the holes, it’s going to hurt your swing in the next shot. I have seen world class golfers play a bad shot and score +2 on a hole. But, they come back within minutes to the next hole Tee Short. Golfer’s got about 5 to 10 minutes to recover from the dampening mindset from the previous hole’s bad performance, else the game is over. Golf is such a punishing game and same analogy applies to GRE Test. Your ability to solve the next GRE question shouldn’t be affected by your performance in the previous question. This follows Take it Easy strategy. Don’t misread the GRE question. If you interpret the question in an incorrect way, you are not going to find the right answer or solve the problem. Misreading the questions costs you time. Time is a precious commodity while take the GRE Test. I have spent 6 minutes trying to solve a question than to get burned towards the end. You have to read the question one time and read it right. During practice, you should make sure if you are reading and understanding the question. Related: Can I use Old GRE Books for Revised GRE Practice? GRE is not designed with time-consuming problems. Answers to GRE test questions shouldn’t take more than 2 minutes. You don’t know the right strategy to tackle that specific question type. While preparing for GRE Exam, your aim should be to learn concepts and strategies that can be applied to solve a problem within 2 minutes. If you can’t solve a problem in two minutes, then you need to go back to your GRE test prep book and look for strategies to solve that kind of problem. If it is taking more than 2 minutes to solve a problem or when a solution is not obvious, skip the question. Come back after you have solved other problems. Magic and wonders can happen when your mind is set free to solve a problem. You never know, next time around, you could understand the question from a different point of view. Different perspective always work. I have witnessed myself many times. Sometimes, shower helps gives fresh thinking. Sometimes, it will be a run or a walk. Sometimes sleep helps solve the problem. You don’t have time for that during the GRE Test. But, you can come back to solve it. In the meantime, you should have solved several other questions. Your thinking will get a different perspective. You can get rid of stuck in the rut feeling to find a better solution or an angle to solve the problem that got your stuck. Find your inner creativity. Have a good meal before the test. Take Energy bar with you and store in the locker. If allowed during the break, have that snack. During practice tests, you are going to take the test for 5 sections. But, during the actual GRE test, you are going to spend extended time. Analytical Writing time should be taken into account. So does the break time. Your Energy level should be high till the end of the GRE test. 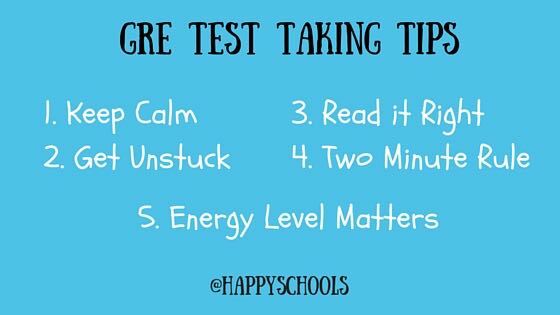 What do you think about the 5 GRE Test taking tips? Were they helpful? Do you have more test prep strategies to share? Post them in the comments below. Share These 5 Tips Image. to reaad this webpage, and I used to visit this website daily.